A new artificial joint restores important wrist-like movements to forearm amputees, which could dramatically improve their quality of life. A group of researchers led by Max Ortiz Catalan, Associate Professor at Chalmers University of Technology, Sweden, has published their research in the journal IEEE Transactions on Neural Systems & Rehabilitation Engineering. For patients missing a hand, one of the biggest challenges to regaining a high level of function is the inability to pronate and supinate. When you lay your hand flat on a table, palm down, it is fully pronated. Turn your wrist 180 degrees, so the hand is palm up, and it is fully supinated. This is an essential movement for using a door handle, a screwdriver, a knob on a cooker, or simply turning over a piece of paper. 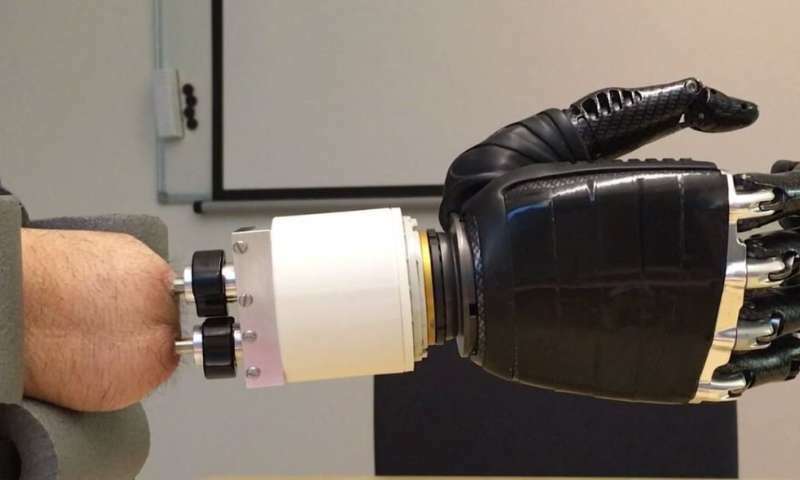 For those missing a hand, these are much more awkward and uncomfortable tasks, and current prosthetic technologies offer only limited relief to this problem. "A person with forearm amputation can use a motorised wrist rotator controlled by electric signals from the remaining muscles. 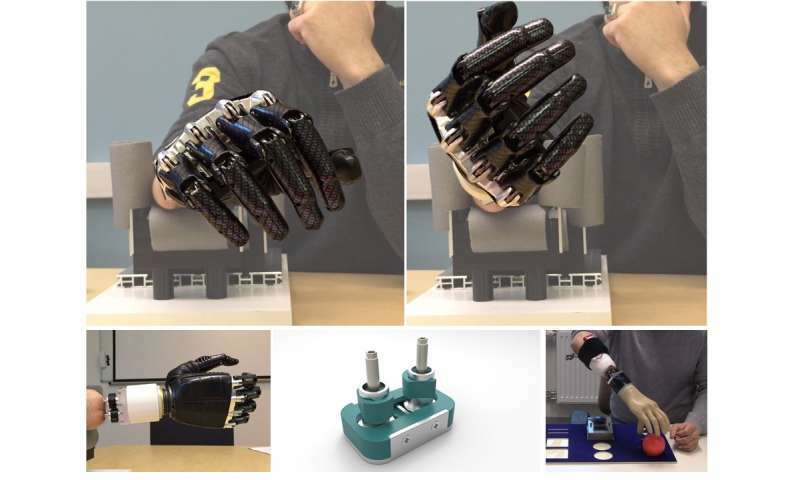 However, those same signals are also used to control the prosthetic hand," explains Max Ortiz Catalan, Associate Professor at the Department for Electrical Engineering at Chalmers. The new artificial joint works instead with an osseointegrated implant system developed by the Sweden-based company, Integrum AB—one of the partners in this project. An implant is placed into each of the two bones of the forearm—the ulna and radius—and then a wrist-like artificial joint acts as an interface between these two implants and the prosthetic hand. Together, this allows for much more naturalistic movements, with intuitive natural control and sensory feedback. Patients who have lost their hand and wrist often retain enough musculature to allow them to rotate the radius over the ulnar—the crucial movement in wrist rotation. A conventional socket prosthesis, which is attached to the body by compressing the stump, locks the bones in place, preventing any potential wrist rotation, and thus wastes this useful movement. "Depending on the level of amputation, you could still have most of the biological actuators and sensors left for wrist rotation. These allow you to feel, for example, when you are turning a key to start a car. You don't look behind the wheel to see how far to turn—you just feel it. Our new innovation means you don't have to sacrifice this useful movement because of a poor technological solution, such as a socket prosthesis. You can continue to do it in a natural way," says Max Ortiz Catalan. Biomedical Engineers Irene Boni and Jason Millenaar were at Chalmers as visiting international students. They worked with Dr. Ortiz Catalan at his Biomechatronics and Neurorehabilitation Lab at Chalmers, and with Integrum AB on this project. "In tests designed to measure manual dexterity, we have shown that a patient fitted with our artificial joint scored far higher compared to when using conventional socket technology," explains Jason Millenaar. "Our new device offers a much more natural range of movement, minimising the need for compensatory movements of the shoulder or torso, which could dramatically improve the day to day lives of many forearm amputees," says Irene Boni.